African Union peacekeepers (AU) take up new positions at a frontline in southern Mogadishu?s Shirkole area on June 2. (CNN) -- At least 17 people were killed and 46 wounded Thursday in heavy fighting in Somalia's capital city, according to a local ambulance group based in Mogadishu. All 17 people killed were civilians, said Ali Musa, a spokesman for the group. Fighting has intensified in recent days as Somali government forces -- backed by troops from the African Union -- have battled insurgents from the al Qaeda-inspired group al-Shabaab. Much of the fighting has been centered around the main market of Bakara, a stronghold for the Islamists now encircled by government forces. Business in the market has stopped due to the fighting over the last two weeks. "Securing Bakara Market itself remains one of our top priorities, since the insurgents use it as a base from which to launch attacks against the population and our forces in other parts of the city, while hiding behind women and children within it," said Somali Defense Minister Abdihakim Mohamoud Haji-Faqi. "They also extort from businesses in the market to fund their brutal terrorist campaign against the Somali people," he alleged. 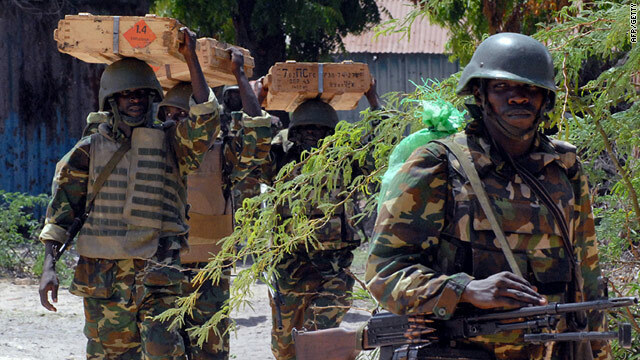 Innocent Oula, chief of staff for the African Union forces in Somalia, urged al-Shabaab fighters and other extremists to leave the market before the immediate conflict worsens. "We have left a clear route open to the extremists to withdraw," Oula said. "What happens now is in their hands. If they refuse to leave ... we will be left with no option other than to force them out."